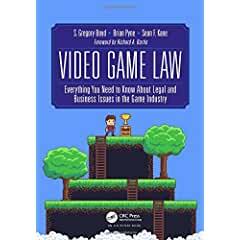 CRC Press has published Video Game Law: Everything you need to know about Legal and Business Issues in the Game Industry. Video Game Law is aimed at game developers and industry professionals who want to better understand the industry or are in need of expert legal guidance. Given the rise in international competition, the increasing complexity of video game features, and the explosive growth of the industry in general, game developers can quickly find themselves in serious trouble, becoming vulnerable to copyright infringement claims, piracy, and even security breaches. Not every video game company has the financial resources to retain in-house counsel – Video Game Law addresses many of the common pitfalls, legal questions, and scenarios facing the industry. S. Gregory Boyd, Brian Pyne and Sean F. Kane, the most prominent,sought after, and respected video game attorneys in the country, break down the laws and legal concepts that every game developer and industry professional needs to know to better protect their game and grow their company.